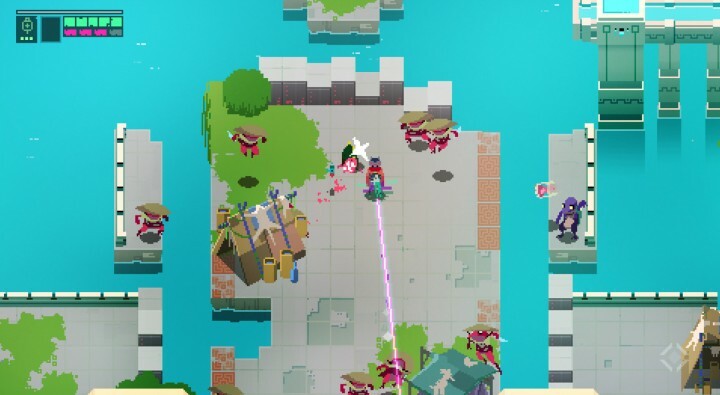 Finally released after a very successful 2013 Kickstarter campaign, Hyper Light Drifter is here to satisfy your old school gaming itch. It’s a gorgeous pixel art game with fluid animations and tight gameplay that harkens back to the days of the SNES. The resulting experience feels like a polished blend of Zelda-style exploration and puzzles with Dark Souls-like combat brutality. 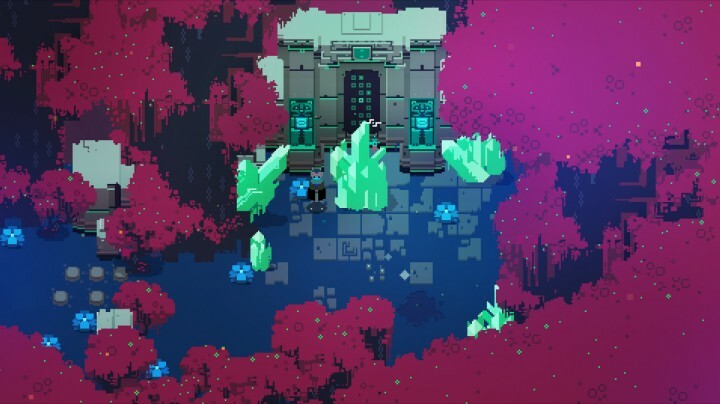 If you’re looking for an open-ended and challenging game that never holds your hand, rewarding your persistence and skill, then definitely give Hyper Light Drifter a shot. 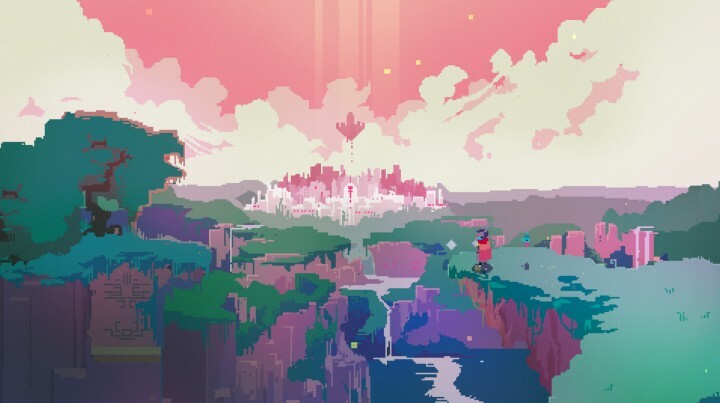 As stated by the game’s creator, Alex Preston, Hyper Light Drifter‘s world is heavily inspired by Nausicaa, the Studio Ghibli movie about a ruined civilization scraping by in a post-apocalyptic world. 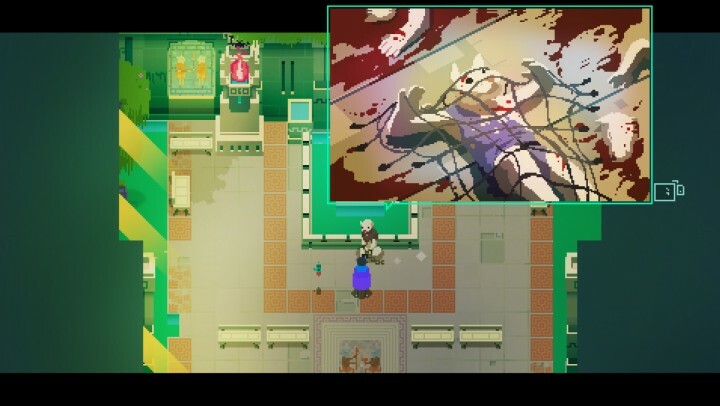 It’s certainly easy to see this in every area of the game, with tired-looking NPCs retelling their tragic stories via detailed image sequences. But also like Nausicaa, the world is still a beautiful place, full of flourishing life and nature, regardless of the state of the people living within it. The water is clear, animals can be seen roaming freely, and there’s a colorful variety of plant life. The environments are lovely to behold, and the game even offers various vista points to take in some impressive views. The sense of discovery makes for an immersive, interactive experience. Underneath the beauty is also a darker, more sinister side, as seen in the many underground facilities. 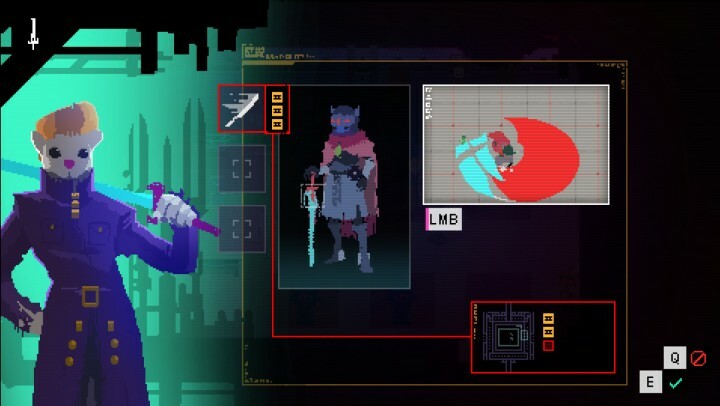 Hyper Light Drifter‘s lore is never given at face value, so you’ll have to put the pieces together yourself — which leaves a lot of room for interpretation. But as you wander through the winding tunnels of the deep, you may find yourself noticing an ominous-looking tube, or a strange bloody altar. The game’s story is told everywhere, you just have to stop and take a look. 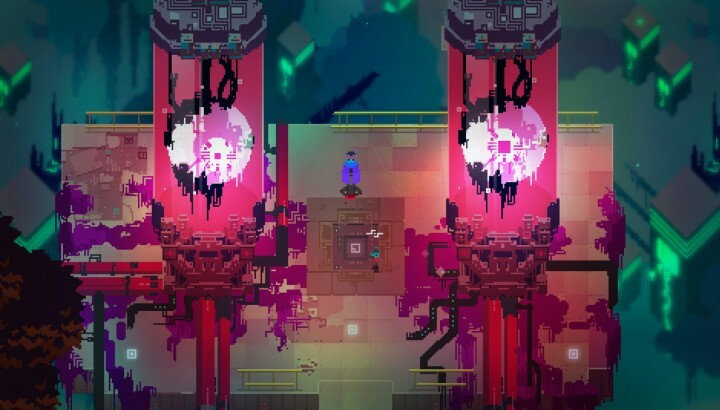 This sense of discovery really makes exploring in Hyper Light Drifter an immersive, interactive experience. There’s a large world to explore too, with four sizeable areas to fight through as you search for the pillars that will unlock the path to your final objective. Each area is themed with a native tribe and terrain, like the watery ruins of the rodent people to the east, or the snowy mountains of the bird people to the north. 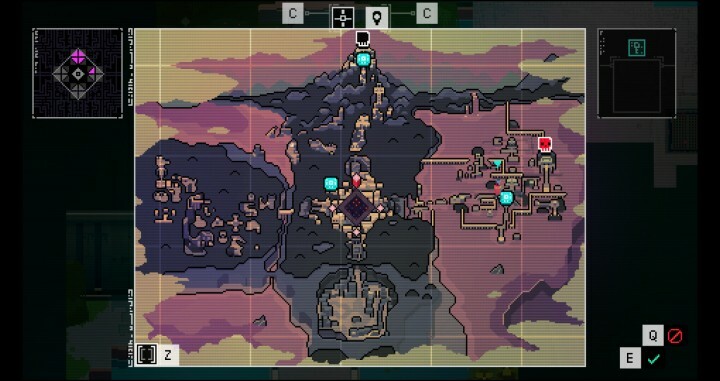 This diversity is used well to craft unique puzzles and enemies that make stepping into each area feel completely distinct from the rest. As for the puzzles and hidden areas, they’re all quite satisfying to discover for yourself. Many solutions and pathways are not obvious, requiring keen observation, quick reflexes, and lots of trial and error — but also rewarding you with rare currency to purchase character upgrades with. Finding these tucked-away bonuses can sometimes be frustrating as the game does tend to rely on wall-hugging for many of its hidden passages, but if you’re not a 100% completionist then you shouldn’t be too bothered by this. In a normal playthrough, you’ll likely find more than enough secrets to get the upgrades that you want for your playstyle. Following the “beauty and the beast” nature of the game world’s design is the combat. The animations are fluid and weighty, with every gunshot, sword swing, and dash having just the right amount of responsiveness and recovery time. This gives every action taken in battle have significance; you can’t simply spam attacks and come out victorious. If you miss your timings or opt for the wrong approach, you’ll quickly find yourself dead. Battles are just as much puzzles as they are tests of your fighting skill. You really need to know each enemy’s attack patterns and which of your techniques are most effective against each type to succeed — mistakes are punished swiftly and few are allowed in the middle of a fight. Dash around without thinking versus bird wizards, and you’ll get blasted away by their destructive magic beams. Trying to run and kite a group of frog ninjas will only result in your body being shredded by their shuriken barrage. But if you line up and execute that perfect dashing strike or laser shot, you’ll quickly start besting your foes. In a sense, battles are just as much puzzles as they are tests of your fighting skill. 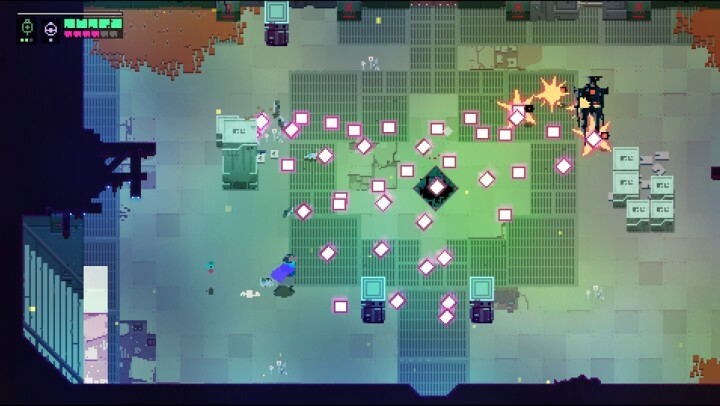 Thankfully, Hyper Light Drifter provides plenty of ways to dispatch your foes, and it’s not completely unforgiving. As mentioned previously, exploring the world will likely reward you with a rare currency. You can spend them at numerous shops in the central hub area, gaining upgrades like new moves, more ammo, and more medkits. Most upgrades are very useful and can significantly make battles more manageable, granting you more maneuverability and damage. As for healing, it’s also designed in a risk/reward way, as you are forced to stop and wait for a brief animation while using a medkit — and of course enemies can still damage you during this time as well. Medkits are also not that common in dungeons. This means that you can’t simply stock up and spam heal to brute force your way through a battle. You really have to learn how to approach each combat scenario, but you’ll definitely feel a sense of accomplishment for overcoming the challenge. Eventually Hyper Light Drifter will put everything you’ve learned to the test with its boss battles. Each boss is unique in its design, attacks, and required tactics. Sometimes it can feel a bit unfair as they can literally one shot you if you’re not familiar with them — and even if you are, if you’re not paying attention. But once you’ve got a grasp on how to tackle their weak points and create openings for attack…well it will still be quite a challenge. One boss can literally cover the ground with magic explosions, and another can summon minions while dashing right at you with a huge sword. But conquer them, and it’s probably the most satisfying feeling that you’ll get in Hyper Light Drifter. 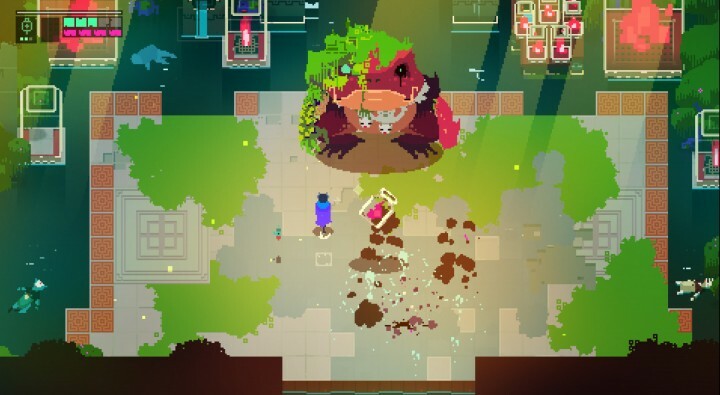 Hyper Light Drifter is a beautiful gaming experience from start to finish in many ways. Its design, both aesthetically and mechanically, is full of detail and respect for the player’s efforts. Sure, it can be rough around the edges at times, with some convoluted map layouts and hair-pulling fights. But it offers a very well-condensed and thoughtful journey that will leave you satisfied, as long as you’re up for the challenge.